Everyone pretends it’s only the first few months of parenthood that leave you bleary-eyed and dazed from lack of sleep. Wrong. Most babies I know regularly wake up during the night for a long, long time. I don’t know if it’s collective amnesia or willful deception, but nobody ever explained this to me in advance. Sleep or no sleep, these tacos–just eggs atop a tangle of sauteed onions, potatoes, and greens–are a nice way to start the day. Breakfast Tacos with Eggs, Potatoes, and Greens: Slice an onion thinly and dice a potato into tiny pieces. Saute both over high heat with a pinch of salt until well browned, then lower the heat a bit and cook a few more minutes, adding water if needed to avoid sticking, until the potatoes are tender. 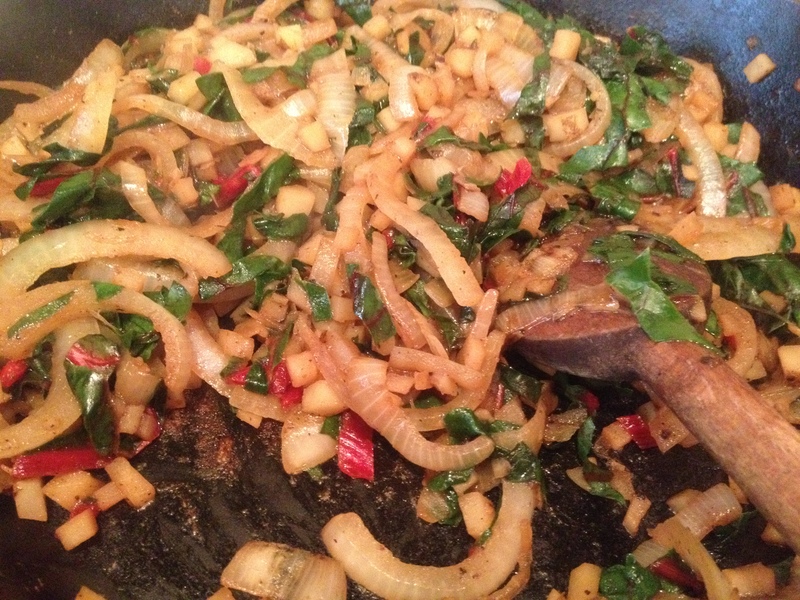 Stir in a big handful of thin chard or kale ribbons and allow them to soften. Season to taste with salt and pepper. Add a little more water and scrape the bottom of your pan to get up all the nice brown crispy bits. Meanwhile, warm tortillas and cook eggs to your liking. 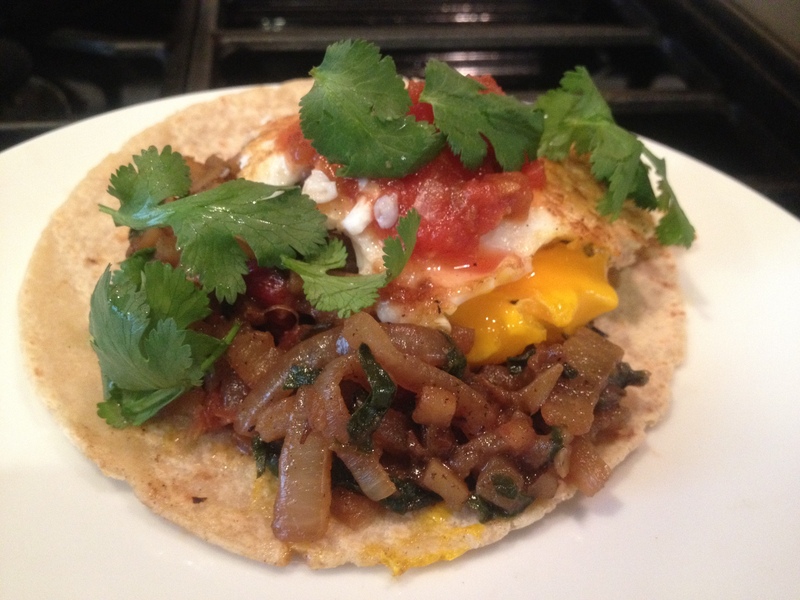 Assemble tacos with vegetables and eggs and top with salsa and cilantro. This entry was posted in Breakfast, Eggs, Mexican Flavors and tagged breakfast, children, cooking, DIY, eggs, family, food, homemade, kale, kids, lifestyle, recipes, tacos, vegetarian on March 29, 2012 by emmycooks. Cilantro gets me every time. And YAY for your baby being a sleeper!!!! I’m with you – tacos for breakfast? Sign me up (I regularly have such a mid morning meal)….congrats on the sleep – I bet you are feeling like a million! November 23, 2006, Thanksgiving day – notable because it was the one day in a six month period beginning on September 16 that we slept the entire night. Breakfast tacos would have made that morning perfect. Looks great. Those tacos look delis! A great idea for breakfast, brunch or lunch. When I look back through the album at the years when my 3 kids were little ones I am struck by how tired I look in all those pictures. There were many years where most nights somebody or other was waking me up. It does get better! At risk of alienating you, I was extremely fortunate with my third child who started sleeping through the night at 13 days. Of course, she was the size of a small pony when she was born so that might have had something to do with that. I do remember, though, how profoundly grateful I was. It’s tough being chronically sleep-deprived! I don’t know nothin’ about babies, but I do know that Mexican food for breakfast is the best. This looks yummers! Yummy! I love breakfast tacos. Always the best way to start the day! And you would be so proud of me: I soaked and cooked cannellini beans last night. Kind of oversoaked them though . . . and cooked them a little too long . . . but I’ll still eat them!